Min Tai Screen Printing Machinery Co., Ltd. These mechanical stretching devices can handle many different sizes of screen fabric ranging from 50 x 50 cm to the maximum dimension as shown in the specification chart below. The weft & warp on a screen fabric can be uniformly stretched by means of adjustable perimeter clamp screws. The unit is excellent for stretching various screen fabric materials such as polyester, nylon and rolled UV screen fabric. The clamping devices are fitted with screws for pressure adjustment to keep the screen fabric from slipping. The unit features high tensile stretching performance of up to 50 Newton/cm2 over a large stretching area providing extremely uniform tension. Screen fabric can be stretched over a multiple number of randomly positioned screen frames placed on the elevation table. 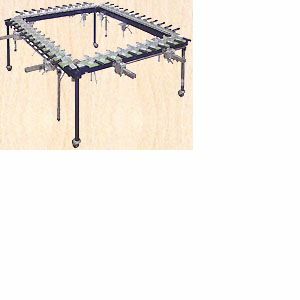 These mechanical screen fabric stretching devices come standard with hand operated table elevation, but pneumatic table elevation is available upon request.